Frugal and Thankful: Food waste and a menu, week 9/1-9/7. Food waste and a menu, week 9/1-9/7. Good morning, my friends! How was your Labor Day weekend? Lots of labor or lots of fun? :) Ours was a true "labor day" - busy and sweaty :) But we caught up on a few things that needed to be done and it feels good. I really dislike greasy, nasty sausage links, my man loves them. But with his stomach issues, it wasn't something he could eat for a while. And honestly, I don't even remember when we got those sausages but they expired forever ago... sad... but I'm not buying them again. Yuck! I'm a bacon girl through and through, lol:) And the strawberries were an unfortunate buy from Walmart. I salvaged what I could in a smoothie but the rest went bad within just a couple of days. And what are you eating this week?? Yummy menu plan Lena! I love breakfast for dinner nights! When the weather gets a little cooler and the cabbage is in, I am going to make that stewed cabbage. IT sounds delicious! I get so mad at myself when I waste food. Part of it is my being forgetful. Last night I set out a mystery bag from the freezer. I thought I'd be able to tell what it was when it thawed. Then I forgot about it and went to bed. Grrr. My freezer is a disaster and I've been working on it this week. Bags of stuff stacked on freezer shelves tend to slide off when I open the door, so I bought some plastic baskets. Your sausages may be ok even if they are past the expiration date. 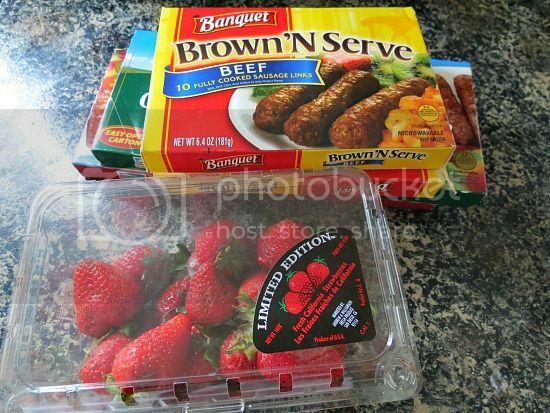 I used to have a website saved that showed how far past an expiration date food can really go, and it was far with freezer food. As long as it doesn't have severe freezer burn I think.